Port St. Lucie Hit and Run | Aggressive Lawyers Eighmie Law Firm, P.A. An early morning run turned fatal after a driver struck a 30-year-old female on the shoulder and failed to stop. The accident occurred near the corner of 12th Street and 58th Avenue. A woman was running on the shoulder of westbound 12th Street when a 2007 Jeep Wrangler struck her, killing her almost instantly. The vehicle immediately fled the scene, and authorities said they had no clues as to the driver’s identity. The force of the collision threw the victim past the eastbound shoulder and onto the grass. Vehicle occupants have multiple restraint layers, not to mention steel cages, for protection in collisions. Even most motorcycle and many bicycle riders have protective headgear. But pedestrians literally have only the clothes on their backs. They are completely exposed to danger. Speed makes the situation even worse. The tortfeasor (negligent driver) does not even need to exceed the posted speed limit for the additional velocity to be deadly. At 30mph, the pedestrian death rate is less than 10 percent. But at 40mph, the pedestrian death rate skyrockets to over 90 percent. Head Injuries: Both the trauma and the motion usually cause permanent brain injuries. The force of the collision usually throws pedestrians several feet. The sudden movement can also scramble a person’s brain, just like someone can scramble an egg without breaking the shell. Internal Wounds: The same trauma and force causes internal organs to grind and bump against one another. That motion triggers internal bleeding. This bleeding may continue unchecked for quite some time, as emergency responders are usually concerned with external trauma injuries. Broken Bones: If the victim survives the crash, and that is a big “if,” recovery is usually long and painful. The extensive broken bones usually require metal pins or plates to set. Then, the victims face long-term physical therapy to regain lost function. Damages in a serious injury pedestrian-auto accident in Port St. Lucie usually include compensation for economic losses, such as medical bills, and noneconomic losses, such as pain and suffering. Investigate local body shops to locate damages vehicles. To expedite this process, attorneys often partner with private investigators. Even if the tortfeasor is not located, many victims still have options. Typically, these individuals may file claims against their own insurance companies. Because the company wants to keep its customer happy, these claims often settle quickly and on victim-friendly terms. 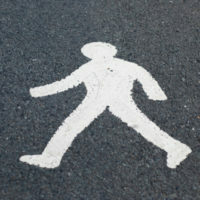 Pedestrian-auto wrecks often cause serious injuries. For a free consultation with an experienced criminal defense attorney in Port St. Lucie, contact Eighmie Law Firm, P.A. We do not charge upfront legal fees in negligence cases.